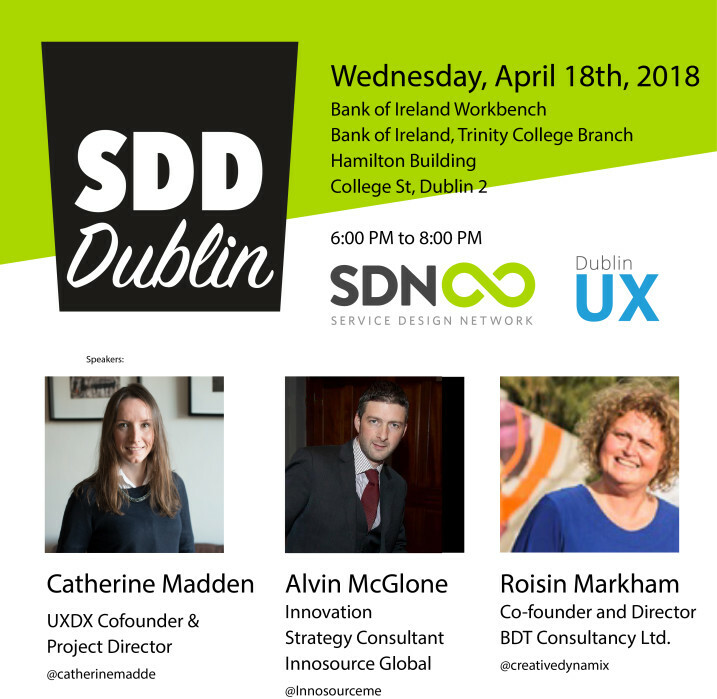 The Service Design Network Ireland and Dublin UX are happy to deliver to you the seventh Service Design Network Ireland meetup! In just 2 short years, UXDX has embedded itself into the heart of the Dublin tech scene. With a mission to speed up product delivery UXDX goal is to help teams solve the challenge of integrating UX into the delivery process and ensure that teams are building products that customers actually want. In this presentation Catherine will take us through what is very much a startup's journey of building a service from the ground up, the challenges that come along with a startup, along with service delivery in a live environment. With an added bonus of a non-designer's perspective on how they’re building a product design event and lessons learnt along the way. Catherine has over 10 years experience project managing and delivering events for industries ranging from Oil and Gas, Marketing, Finance and Government, primarily in Australia/APAC. With an early career in research, Catherine has worked in Customer/Member Engagement and content marketing. She has also founded three startups. Talk: When Business Strategy and Design Collide. It’s the old cliché, I hear it all the time form designers and business owners after they have spent valuable time and resources designing and launching new products or services just to see them fail. A recent research study by pricing firm Simon-Kucher & Partners shows that 72% of all new product & service introductions fail to live up to expectations. In this talk we will take a look at the role of service design within an overall business design approach and how business model design enhances the capabilities of services designers. I will select relevant examples to discuss in the presentation; however the emphasis of the talk will be on the emerging changes in the overall design approach in designing products and services. What’s working and what’s not. So come along and join the discussion. Alvin is the owner and lead Innovationist at Innosource Global consultancy, a new start up company aimed at delivering Innovative Design Lead Strategy and Innovative Strategy Lead Design to the Micro and SME sectors. Talk: Establishing trust in teams to deliver better outcomes. When we consciously use trust as a design principle in HCD we open conversations and bring individuals into the work more easily. Established trust brings better group engagement and more open collaborative, aligned and deeper innovative work. As a consultant stepping into organisations, learning environments or communities establishing trust has been critical to the success or failure of the work. Not everyone sees the advantage or applies the same level of attention to establishing trust and that produces different levels of results. I’ll give examples of establishing trust in education and scaling design thinking, pushing boundaries in group facilitation and a recent service design project that challenged me to rethink trust, designing a process to break a team’s psychological safety. Roisin Markham is the co-founder and Director of BDT Consultancy Ltd, specialising in innovation, growth, change and delivery with a diverse group of clients. A dynamic innovative catalyst with deep expertise in HCD, systems thinking and Innovation practices. She describes herself as a curious hyper learner with a keen eye for emerging technologies, disruptive potential and a strong customer-centric approach to problem solving. Roisin Markham - Co-founder & Director BTD Consultancy Ltd.